Dry nights, here we come! We went for it last night. 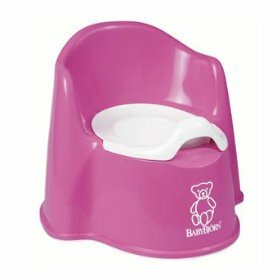 After six months of lifting DD (3.5) onto her potty at 10ish or before we went to bed, in her sleep, we went cold turkey and she was dry all night! Hurray! She’s been out of bedtime nappies since just before her 3rd birthday – again, cold tukey, because I ran out of the princess pull ups without realising – necessity being the mother of invention an’ all that. I was going to wait until her 4th birthday in August before attempting it, thinking that would be a good milestone and she’d be sorted well before starting school in September. But for the past week or so she’s been so deeply asleep when I’ve gone in to lift her that it’s taken ages to get a teeny wee out of her, and it felt a bit mean waking her up. And she’s not been that bothered about bedtime milk for ages, apart from liking that she’s allowed to have a teaspoon of Nesquick strawberry or chocolate in it (yes, I know). DD responds really well when I explain things properly and give her plenty of notice, so at teatime I told her she’d need to have a big drink because there would be no more bedtime milk because she’s a big girl like G&L, her two older good friends, and I wasn’t going to disturb her sleep by putting her on the potty anymore. I felt a bit nervous, and put a spare sheet and Dry Nites bed pad within reach just in case she woke up wet in the night and needed changing. Her potty is by her bed, with her princess night light, as usual, and I told her that if she woke up and needed a wee she could just hop on the potty by herself. We have those 1930s doors upstairs with high handles, and she’s never left her room at night by herself (I do know how lucky I am, yes), although she stands on a chair to turn the big light on and open the door in the mornings. Anyway, she slept brilliantly, unlike me as I was half listening for the loud wail she does whenever she’s had a bad dream, and when she woke up this morning she got up and did a wee in the potty. I know it’s only night one but I’m so pleased. It feels like a real milestone and we gave her a big cheer this morning, although I don’t think she thought it was such a big deal, bless her. The next big Potty Adventure in this house will be getting DS out of daytime nappies next winter. I found him chillaxing fully-clothed on the big pink potty in the downstairs toilet yesterday, and he likes to watch his big sister sit on the loo (which she finds very annoying) so hopefully that will be pretty straightforward. Until then, at least I only have one small person’s ‘movements’ to deal with directly.